Mustafizur Rahman is a left-arm fast bowler from Bangladesh. Born on the 6th of September, 1995, the “Fizz” is the only cricketer to have won the Man of the Match awards on both ODI and Test debut. Rahman started practicing cricket at a place that was 40 kilometers away from his home. He started out as a batsman but switched to pace bowling after taking inspiration from Mohammad Amir. The Bangladeshi player started his domestic career by representing Khulna Division and Abahani Limited. He finished the first-class season with 26 wickets at an average of 19.08. He was also admitted to the Bangladesh Cricket Board’s pace bowling foundation after scouts discovered his talent. Rahman played in the U19 World Cup in 2014 in UAE, where he took a total of 8 wickets. The “Fizz” as he is rightly called due to his variations, made his debut against Pakistan in a T20 match on April 24, 2015. He bowled four overs at an impressive economy rate of just 5.00 and picked up two crucial wickets which saw the Tigers winning the game by seven wickets. Less than two months later, the pacer made an impressive debut against India in the ODI series. He picked up 13 wickets in the series, which included two fifers and set a record for the most wickets in a bilateral series by a debutant. 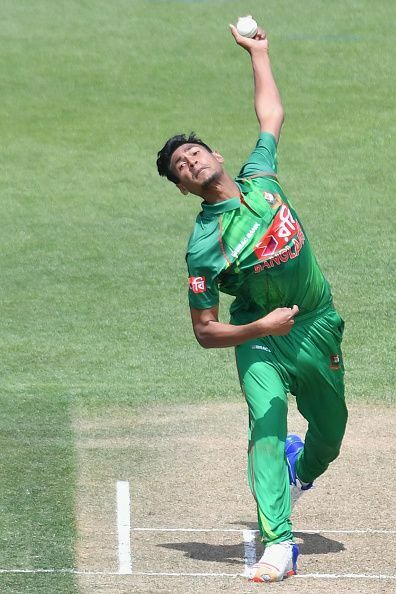 Mustafizur kept taking positive steps in his international career. He became an integral part of the team after just a few games as he kept piling wickets against South Africa and Zimbabwe, all of which ended on winning causes. Rahman has also developed the left-arms off-cutter that was bowled like a spinner but had the wings to reach the keeper on the full. His variations made him a difficult customer as the batsmen were finding it hard to pick his slower deliveries. In the 2016 T20 World Cup in India, Mustafizur bamboozled the Black Caps with his variations by picking up a fifer for just 22 runs. He was a part of the ICC ODI Team of the Year in 2015 for his exploits in the format and also won the ICC Emerging Cricketer of the Year. At the age of 21, the fast bowler earned an Indian Premier League contract in the 2016 auctions. Sunrisers Hyderabad purchased him for Rs. 1.4 crores. In March 2016, Rahman also signed for Sussex to play in the Natwest T20 Blast. He picked up four wickets in his first game but was ruled out of the remaining of the competition due to a shoulder injury. Rahman’s short career has already been affected by quite a few injuries. He has picked up side strains and shoulder injuries that forced him to miss several matches. In his debut ODI against India, the fast-bowler was involved in an on-field collision with MS Dhoni. This cost him 50% of his match fees.